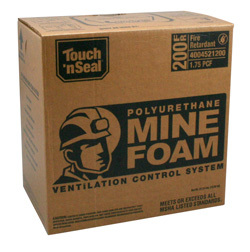 Formulated for use by the underground mine professional, Touch 'n Seal Polyurethane Mine Foam is used to control mine ventilation by sealing air leaks in and around metal, wood and concrete stoppings, overcasts, electrical and plumbing chases and other areas which may need ventilation control. It can also be used to fill voids, control water leaks and run-off, and provide sound and thermal insulation. The unique formulation allows for quick and complete cure with strong bonding to most surfaces in a wide range of substrate and ambient temperatures.